If you’re moving into a new house soon, congratulations! It’s an exciting time, but it can also be a lot of work. 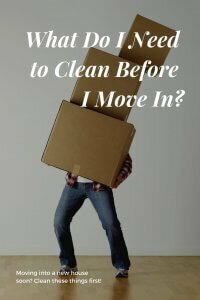 You might be wondering what you actually need to clean in your new home and what you can skip cleaning to save yourself some work during this busy time. The most important things to take care of in your new home are germs and odors. The home was probably cleaned when the old owners moved out, but you don’t know how well it was cleaned and what they did or didn’t clean. The old owners may have had pets that left an odor, or maybe they smoked and left behind a smoke odor. You might not notice it at first, and move all of your stuff in. Then, when do notice the odor, you might have to move your furniture to get to the source of the odor to clean. It’s better to clean it right off the bat. Plus, you don’t know how sanitary the previous owners were. If they left behind germs, bacteria, allergens, or even mold, your family can suffer the consequences. That said, here’s a quick overview of some of the things in your home that you need to clean and some things you can skip for now. You might not realize it, but walls can be a source of odor in your home, especially if the previous owners smoked. Before you move in furniture, wipe down all of the walls. This will help with any smoke odors that might linger in your home. Plus, you can rest assured that the walls behind your bookcases, couches, and other furniture is cleaned, since you might not be able to reach them again. Carpets are often the home of both odors and germs. If the previous owners had pets, there may be pet smells in the carpets in places that you don’t expect. Plus, carpets can harbor germs, bacteria, and allergens. The best way to get your carpets free of odors and germs is to have them professionally cleaned. Schedule a carpet cleaner to come before you move in any furniture. You don’t want to trap a cat urine stain under your bed without realizing it and then have to tear apart your room to find the source of the smell. Windows and mirrors are some surfaces in the home that are pretty easy to tell when they are dirty. That’s why many people clean them before they even list their house. Take a look at your glass surfaces in your home. If they look like they have been cleaned recently, they probably have and you can skip them for now. If they have streaks or otherwise look dirty, clean them with a good glass cleaner. The surfaces that are most common in your bathroom and kitchen are also the most prone to mold and bacteria growth. Take the time to scrub the tile and grout, or have a professional tile cleaner take care of it for you. This will help remove any mold that may be growing your home. Also clean any other surfaces that are in these rooms, such as the tub, toilet, countertops and more, just to be sure they are clean and sanitary for your family. If you’re getting the fridge with the house and not buying your own, you’ll want to clean it. Pull out all of the drawers and wipe them thoroughly out. Use a sanitizing wipe to kill any germs that may have been left behind by the previous owners. Also clean any other large appliances left behind, such as the stove. Some appliances, like a dishwasher, will have a wash cycle that you can run with a special cleaner to do the work for you. If you’re moving into a furnished place, you have the benefit of not having to purchase furniture. However, this comes with the downside of not knowing where that furniture has been or what is on it. Have a professional upholstery cleaner take care of any used furniture in your home before you make yourself cozy. Of course, your exact situation will be unique. Take the time to clean anything in your home that you feel like needs it so that you can be completely comfortable in your new home! The extra work will be worth it for the comfort of your family.